Jerilyn Callen, MS, OTR, earned her entry-level Master of Science in Occupational Therapy from Touro University Nevada in 2008. In 2016, she began her post-professional Doctor of Occupational Therapy program at the University of Utah with an expected completion in summer 2018. Ms. Callen has been in clinical practice for 10 years. Callen accepted a core faculty position at on the Austin campus in July 2017. As core faculty, her course assignments for the MOT program include psychosocial interventions and gerontology interventions and lab courses. She also is an onsite fieldwork educator for level 1 students in a community-based mental health program. 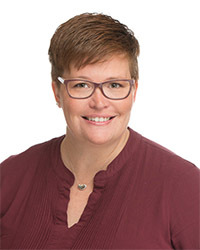 In her clinical practice, Callen has specialized in pediatric, mental health, and geriatric populations and provided services through models of delivery including early intervention, school-based practice, community mental health programs, home health, and as a director of therapy services for a skilled nursing facility and large home health agency. Callen has also completed many AOTA, state board, and community-based continuing education courses which allow her to have both Pediatric and Research and Education distinctions from the National Board for Certification in Occupational Therapy. Her current research includes her capstone project which focuses on the creation of curriculum for student clinicians utilizing the therapeutic use of self as a means for collaboration.